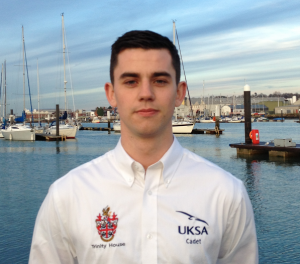 Thomas Higgins, 22, of London, is one of our new cadets on the Superyacht Cadetship. Here he speaks about how the opportunity has changed his life. He was granted a bursary by Trinity House following a successful application process, and he can’t believe his luck. He said: “Trinity House is paying 75% of the first phase, including food and accommodation, and they give me £200 a month living allowance. They also pay for the foundation degree I am doing as part of the course. A student loan covers the rest. You can imagine, I am ecstatic. It has completely changed my life, and I can hardly believe it is happening to me. “I started in October and have been doing theory, and have been out on sea phases already, on the Farr and some smaller yachts. I hadn’t even been on a yacht previously but I have absolutely loved it, I haven’t been sea sick and I have loved it when it has been rough out on the water. Some of the passages have been quite tough but overall it is all fantastic experience. “Hopefully by March I will have found my first employment on a superyacht, but if not I will go to Antibes and dock walk to find some, as I want to get into the industry as soon as possible before coming back to UKSA for the rest of my training. I am really driven to get myself a good career now I have been given this opportunity, it is such a privilege, I just want to work really hard to get as far as I can in the industry. Thomas is one of many people who knew he wanted to be part of UKSA as soon as he stepped foot inside the campus gates. He explained: “I came to UKSA for an Open Day after meeting someone who had done a hospitality course here and they recommended it. She explained all about UKSA and it sounded like what I wanted, and when I got here I just fell in love with the place. UKSA is offering funded places on its flagship course through generous bursaries from Trinity House and Seafarers UK. To find out about bursaries, email [email protected] or telephone 01983 203038 for an application pack.